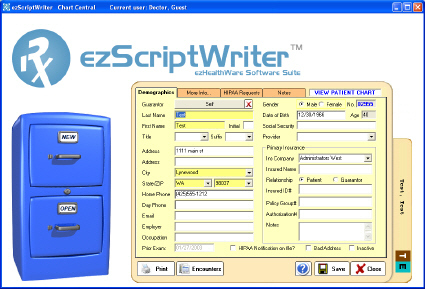 ezScriptWriter is a powerful yet easy-to-use software system for creating and printing medication and/or ophthalmic prescriptions. It includes a built-in word processor, report editor, Rx logbook feature, reminders and note documentation tool in one application which you can use to organize your patient demographics, Rx\'s and other data. ezScriptWriter uses familiar images as the cornerstone of the user interface. For example, to create a patient chart, one click on the "NEW" drawer of the FILE CABINET gets you there. A patient chart looks onscreen similar to what you would see in the paper format. Rx\'s and notes are presented in lists, that can be double clicked to call up the appropriate report. The report editor is similar to standard word processors seen in Windows XP. In order to quickly build an Rx, a Wizard is available to walk you through the process. Whether you are creating a medication Rx, a spectacle Rx or a contact lens Rx, the Wizard gives you the tools to easily enter your prescription data. One of ezScriptWriter\'s great strengths is that it allows you to create Rx\'s based on prior data, simply by double clicking on a past Rx in the LOGBOOK. Although functioning mostly to generate Rx\'s, ezScriptWriter can also help you save time by generating letters, reports and patient handouts. Many pre-existing sample reports are already included or build your own! Since ezScriptWriter can export data in both text and PDF formats, you can send your Rx\'s and letters in email or simply create backup copies that can be opened on any computer.